I use this activity to teach spelling and mechanics in English Composition, but it can be adapted to fit almost any content. When students come into class, assumably having read their chapter on spelling and mechanics, I give them a short quiz to pre-assess what they have retained. We correct the quiz as a class, with students correcting their own quiz. Each group is required to create a poster, using markers and poster-paper I provide, that highlight the rules for their assigned category, along with an example sentence that illustrates the rule in practice (rules need to be paraphrased and not copied from the textbook). In addition, each group must create one false or “made-up” rule. The goal here is to use formal language to create a rule that “sounds” like it could be true, thus mimicking academic writing. For example, the student’s textbook identifies three rules for using the hyphen. 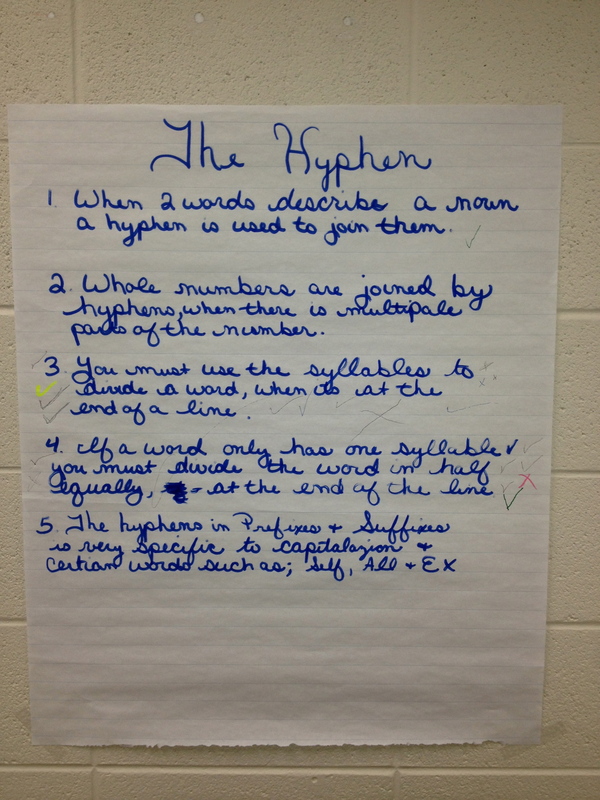 The group assigned to hyphens would need to create a fourth rule (the lie) and integrate it into their poster (preferably not as the last rule on the poster–too obvious). Once the posters are complete, groups hang them around the room with tape. After they are all hung, all of the students in the class now walk around the room viewing each poster (no text-books allowed at this point) and, using a pen or pencil, put a check by “rule” on each poster (except their own) that they think is false. Once everyone has voted on each poster, the instructor now moves from poster to poster discussing each rule and pointing out the lies. Those who fooled the class (had the most votes on their fake rule) should be praised for their academically deceptive writing, and the rest of the class should be humorously admonished for not recognizing the fake rule. This is a perfect “teaching moment.” In addition to the concepts, we also talk about academic tone, paraphrasing, and the wording of examples. After the activity, students should be given another short quiz to see if they have retained any of the knowledge from the activity. Generally, I take an informal poll after we’ve self-corrected the quiz, to see who improved their score from the pre-assessment given at the start of the activity. Generally, I’ve seen about 70% higher scores on the second quiz. ← Free Coffee for A’s! !